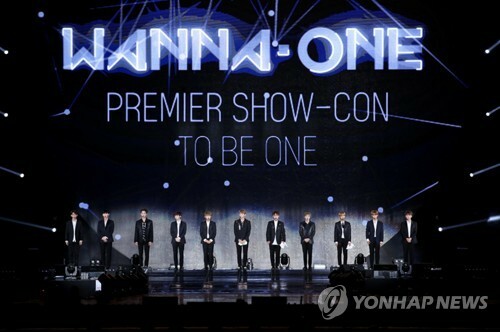 SEOUL, Aug. 10 (Yonhap) — Chart-topping rookie band Wanna One and seasoned idol act Girl’s Day will perform at Australia’s first-ever KCON, the premier global Korean pop music and culture convention, next month, according to organizers Thursday. The two groups will be part of KCON 2017 Australia scheduled to be held at Sidney’s Qudos Bank Arena on Sept. 22-23, CJ E&M said. EXO, Monsta X, Victon, along with UP10TION, Cosmic Girl, Pentagon and SF9 were also confirmed in the lineup. Wanna One is an 11-member boy band formed of the final 11 survivors of Mnet’s audition show “Produce 101.” The band made a jaw-dropping debut on Monday, having sold over 500,000 copies of its EP through preorders. Its lead track “Energetic” topped all major streaming music charts within hours. Girl’s Day, now in its eighth year, is one of the more seasoned-yet-active girl groups today, while EXO released its fourth full-length album “The War” last month, selling over 950,000 copies to date. Along with two days of K-pop concerts, various meet-and-greets, K-pop choreography classes and Korean food-tasting events will also be available for attendees. Starting in Irvine, California, in 2012, KCON has become sort of an annual pilgrimage for K-pop fans around the globe, attracting more than 350,000 attendees throughout its five-year run. Staring with Mexico City in March, KCON events were held in Tokyo, New York and Los Angeles this year.